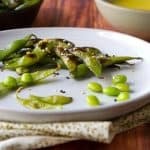 This Charred Edamame with Miso Lemon Dipping sauce appetizer recipe is healthy, delicious and ready in under 30 minutes for vegetarians and vegans alike. Add the canola oil to a cast iron skillet over medium high heat. Add the edamame and cook about 5 - 6 minutes until edamame are charred in spots. Remove from heat and sprinkle with sesame seeds and serve with the dipping sauce. Add the lemon juice to a blender. With the machine running, add the miso paste. Blend. Slowly drizzle in the olive and canola oils. Taste and adjust lemon juice and/or miso paste to your taste!